Do you remember back in October, when I told you about the generous gift of an enormous bag of yarn, that I received? Well, though I started the Modern Quilt Wrap, I have ground to a halt on it. This is mainly because of Christmas knitting. However, there is one project that I completed using my inherited yarn. You can actually see it at the bottom of this photo. It's the pink strip. This little strip, tucked away at the bottom of the photo is the only place I can find on my blog that I referred to this project. This is sad, but it means I have a whole project to tell you about today. The pattern is the Peaks Island Hood by Ysolda Teague. I do love Ysolda's designs, but sometimes her patterns are a little tricky to understand. This pattern is not a very straight forward one. 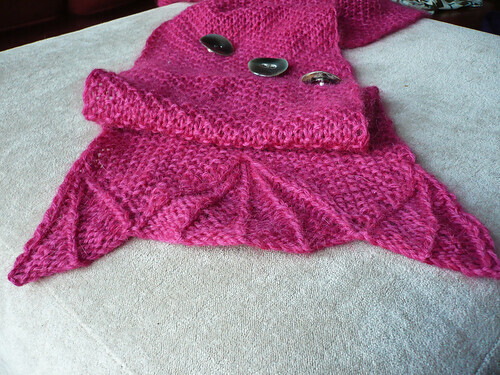 The pattern is for a scarf, with increases and decreases making a hood. 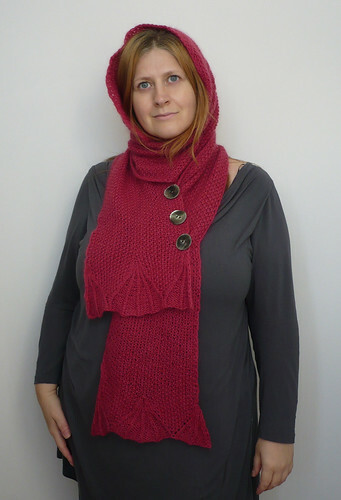 The scarf and hood are in moss stitch apart from "shells" at each end, and similar shapes in the hood area. 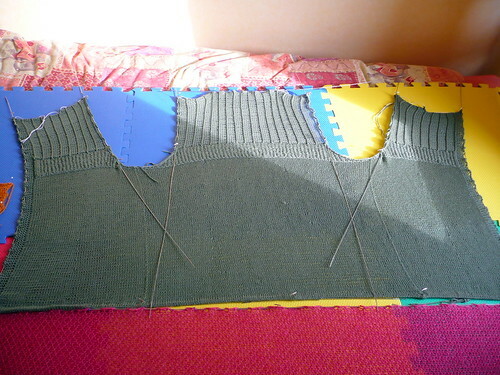 The shells are made with increases and decreases around a single rib, with reverse stocking stitch in between the ribs, and moss stitch outside the ribs. If you think this sounds complicated, it is quite. 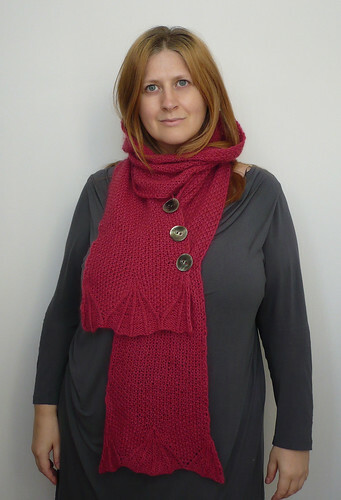 This accessory is wrapped around the neck and fastened with buttons, making it a scarf, with a hood. I've been looking for something like this for a while, so I thought I use my inherited Rowan Kid Classic yarn to knit the pattern. up. 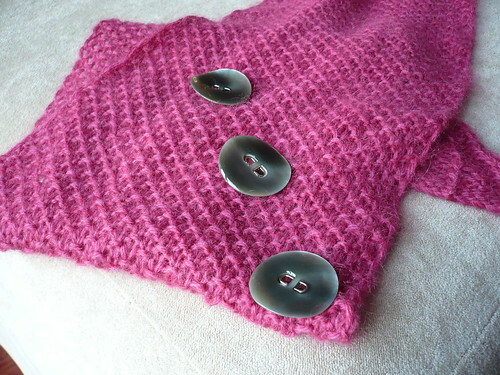 In the above picture you can see how I've angled the buttons across the width of the scarf. I tried the scarf on and got it to sit how I liked it, then attached lockable stitch markers through the space made by the buttonholes onto the scarf behind. 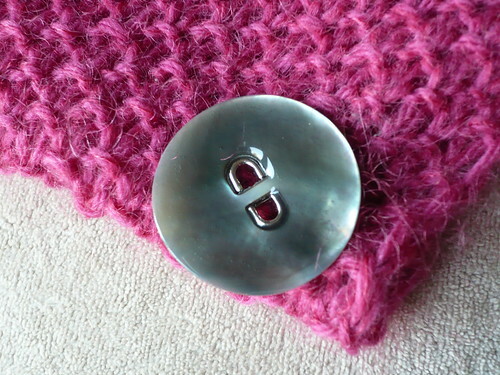 I then attached the buttons, where the stitch markers were attached. It worked first time, which for me is a minor miracle. My buttons never end up where they are supposed to! I got these buttons from my friend Mary Clare. I bought these same buttons last Winter when I lost a button on my Winter coat. I replaced all the buttons on my coat with these gorgeous buttons, so I was really pleased to find Mary Clare has some left, so my scarf and coat would match. By the way, my friend Mary Clare, now has an eBay shop where is she is selling off her old shop stock at very reasonable prices. She also makes project bags and other lovely things which would make great Christmas gifts. If there is something you want that is not in the shop on eBay, it is worth contacting her to see if she has it in stock, but not listed yet. I don't know if this bag is listed on her eBay shop yet, but it's a good example of her work. I love the handles that she makes! I have to confess, I have already bought one of these bags and they work brilliantly for knitting projects. The bag sits on the floor with your yarn inside while you knit. Anyway, back to my scarf. As you can see, these scalloped shapes on the scarf are very pretty and unusual, and these are the areas of the pattern that are a little less than straight forward. There are instructions that use the words "continue in the pattern as set" but I really had to think hard to work out how that pattern would continue with only one row written out to work from. As I said at the beginning, I think I stretched this scarf out too much during blocking. This has made the fabric of the scarf and hood thin and very drapey, which isn't such a bad thing, but it does make the hood less effective. I know that this yarn is really warm as one of the first garments I ever knit for myself was in Rowan Kid Classic, and I hardly wear it because it's too warm. This scarf is so much thinner and therefore doesn't keep my head as toasty warm as I'd hoped. However, this means, the scarf/hood will be more useful in the Autumn and Spring when a heavier weight scarf and hat combo will cause me to overheat. Despite the mistake of over blocking, I do really like the project, and I'm sure I will wear it a lot when the weather is a little milder than it is at present. To look at other pretty projects, click on the buttons below.